While nothing beats risking your own life flying through burning barrels, designing dangerous treacherous fun new obstacle courses for others to race through has to be a close second! For our next forum activity, we would like everyone to design an Aingingein course! While a normal course consists of a series of barrels set on fire atop high stilts, followed by a final goal barrel, we welcome any new ideas or deviations you may have in mind. How many barrels will you have? How will they be placed? How much fire will you use? Will you include any obstacles other than fire in your course - because really, why stop there? Show us what your course looks like by first creating a graphic, then including a few sentences describing your overall course and types of obstacles. You could make a schematic, draw someone flying through your course, etc. Whatever you can think of! Re: Week 3 - More Fire?! I made Aingingein all about dueling. Two players will fly against each other on their own course. The course will be similar, but opposite of each other as you can see in my schematic. 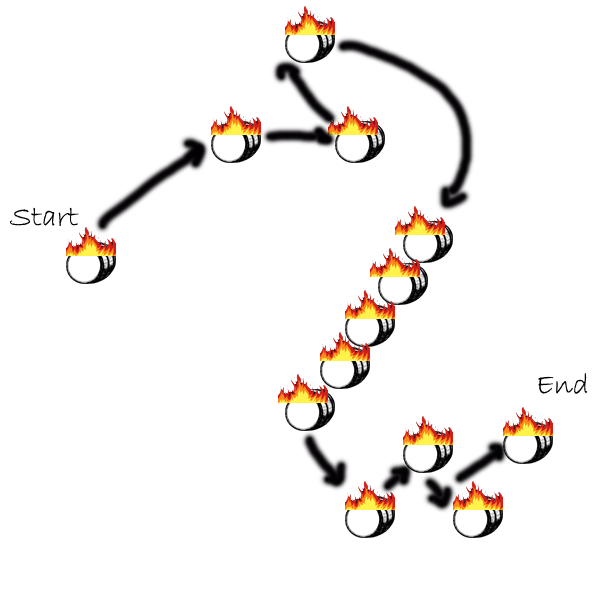 Each player has to go through 6 burning barrels, which are set on flames by a real dragon (of course the dragon in the real game won't be this cute, but I didn't want to scare you all of before we even started the game). So each player flies through the 6 hoops with their Dom (the goat's gallbladder). The hoops are of different heights, so there is some steep flying involved. In the end the two courses comes back together and the first player to throw the Dom through the final barrel wins. So the game is still about the fastest time, it is just even more competitive now. This Aingingein course has three main obstacles - the loop, the pendulum, and the zigzag. For the loop, competitors must start out with enough speed and gain enough momentum to be able to fly through all of the barrels situated in both of the loops. The barrels in the pendulum segment are enchanted to continuously swing. This tests the competitors' timing. The zigzag forces fliers to change direction frequently to weave through the barrels. All of the barrels will be burning, but the color of the fire will change. Points are different depending on the color of the flame: Pink = 5 points, Green = 10 points, Blue = 15 points. However, if the fire is in between colors when the person flies through, the competitor receives no points for that barrel. The color of the flame when throwing the Dom into the final barrel also factors into the final score. Also, distance from the final barrel and throwing position are important. Successfully throwing the Dom into the final barrel in the Starfish and Stick position can knock an entire minute off the flying time! The winner is determined by an algorithm that includes the total number of points accumulated and the shortest flying time. Instead of being anchored to the ground in anyway, the hoops are free floating and liable to bob up and down slightly, again forcing quick-thinking as well as quick flying. My main addition is that of a phoenix. 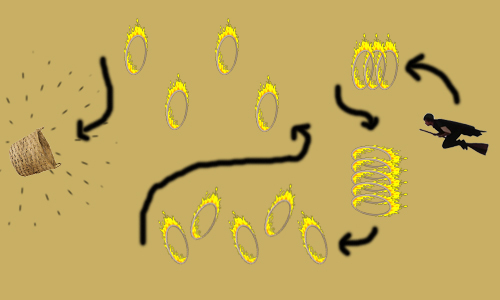 Able to disappear in a flash of flame and reappear elsewhere means the game bird can rest on any one of the rings and quickly appear on another. This can be both positive and/or detrimental to players. On one hand, if they fly through a hoop the phoenix is resting on, their overall time is reduced by 5% at the end (the more this occurs, the lower the time) on the other...well this IS Aingingein. If they fly through a hoop as a phoenix is flaming up to disappear, they could be caught up in the resulting fireburst. They may also be distracted by its sudden appearances and disappearances and end up burnt by the rings themselves. There's also the added need to dodge the game bird's long tail to avoid burns. Luckily, the addition of the phoenix means that any grave injuries can be seen to quickly with a few tear drops. Obviously the lack of domesticated Phoenixes makes this version of Aingingein difficult to put together, but hey, maybe the Motohora Macaws will let us borrow their mascot, Sparky! The first obstacle is pretty easy. 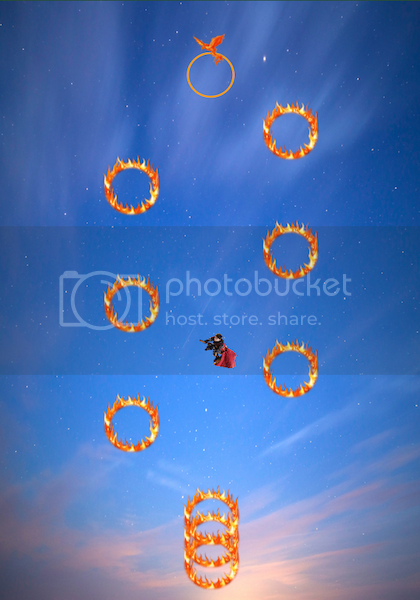 The players need to go through three flaming hoops at once. After that, they swerve sharply down where five flaming hoops wait for them. They need to go strictly vertical, otherwise they will caught on fire, poor things. Those who survive turn left or rather, facing the end basket and need to fly quickly through the next five flaming hoops, which are positioned in an up and down zig-zag pattern. Last obstacle are the four hoops for which they'll have to go back toward the starting point and up. They magically move up and down in random speed and intervals, so it's based purely on luck what pattern they'll be when a player moves through them. Good luck anticipating that! In the end, they need to get Dom into the basket, while fireworks explode around them. In my course, the hoops look like (they are hoops with a charm to look like that) giant butterbeer barrels because when I first heard about Aingingein, I thought that kind of barrels where the ones used! The course itself is pretty easy, at least at sight! You pass the first one, then do that triangle just how the arrows show, then to the barrels that are one after each other and finally to the zig-zag ones. Sorry about explaining it so messyly, had technical problems and couldn't do it until the very last moment! Placement 50 feet about ground level. Basically this course is made up of five fiery hoops; four of them rotate around a center, stationary hoop. 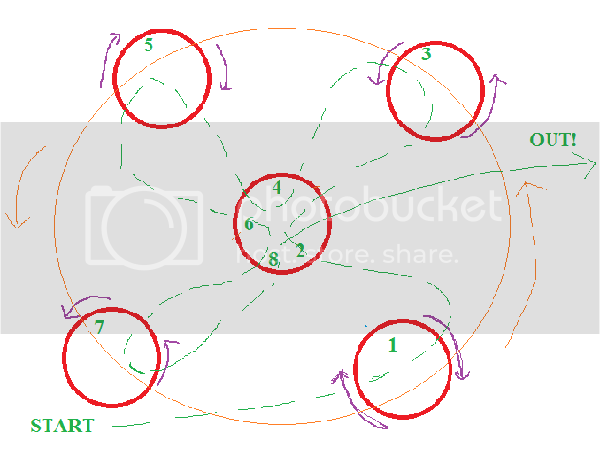 The hoops must be entered and exited in the pattern marked. The hoops on the edge both spin (in opposite directions as indicated) on a vertical axis (making it harder to enter them)(and harder to exit safely) and they also travel in a counterclockwise direction around the center hoop. Round three is the same as Round two, but the hoops are moving and spinning faster.